Welcome to Texas Horse Park! 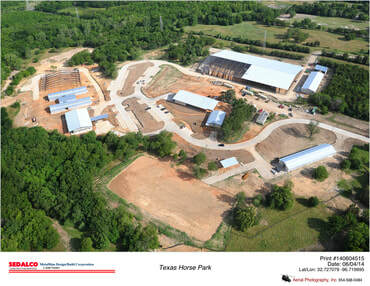 The Texas Horse Park construction was completed in late 2014. These early sample renderings, the building in progress and the aerial views of the horse park will help you to see the basic layout of the various areas including the entrance to the park, administrative offices, activity and event center, multiple barns and both indoor and outdoor arenas. ​The outer lying forest areas is used for our extensive trail riding. We would love to show you and your group around! Please call us for a tour!